Mark Bunn is a goalkeeper on the books of Blackburn Rovers. A solid shot-stopper, Mark began his senior career with Northampton Town, making his senior debut in August 2005. Mark went on to spend two seasons as the Cobblers? regular ?keeper before signing for Blackburn in the summer 2008 transfer window. His debut for Rovers came in the FA Cup third round tie at Blyth Spartans in January 2009 and later that season he spent time on loan at Leicester. 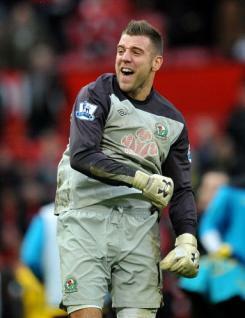 Mark spent much of the 2009-10 campaign on loan to Sheffield United, but in 2010-11 he was back at Ewood Park. He featured in the club?s successful reserve team and also acted as cover for Paul Robinson, eventually making his bow in the Premier League when he came off the bench against West Bromwich Albion in December and also featuring in the following two games.